BMW just won a bid to supply the Los Angeles Police Department with 100 i3 electric cars. The LAPD chose the BMW after a year-long evaluation of several types of electric cars — including the Tesla Model S.
“The LAPD tested a number of vehicles that would suite their needs and chose the i3,” BMW North America’s executive vice president for operations Petter Witt told Business Insider. According to CNBC, the LAPD chose BMW over the Tesla Model S for the time being because of concerns over the practicality of having an electric high-pursuit-vehicle. 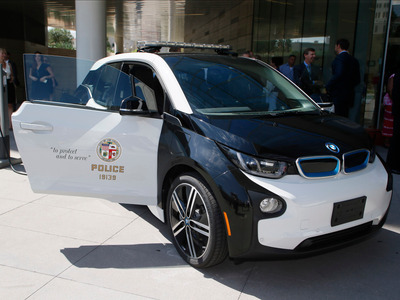 According to BMW, the LAPD’s newly acquired fleet of i3s will not serve as pursuit vehicles. Instead, it will be deployed as part of the department’s transportation fleet. The LAPD’s adoption of electric vehicles such as the i3 is part of Los Angeles Mayor Eric Garcetti’s sustainability plan. Apart from police decals and light bars, the LAPD’s fleet of BMWs are mechanically identical to those available at local dealerships. The i3 is powered by a 170 horsepower electric motor with a 22 kWh lithium-ion battery pack. BMW claims the compact hatch back has an all-electric range of 80 to 100 miles. Although BMW declined to comment on the financial terms of the deal, the i3 starts at $42,400. According to Witt, the LAPD deal is just beginning for BMW’s municipal fleet business. In addition, BMW is interested in expanding their fleet business beyond its electric i3. Witt pointed out that the its X5 plug-in hybrid SUV and its 56 MPGe of fuel economy could be an attractive option to many.